We are the only smoke ventilation specialist to offer service. Marshall Electrical Services have added another service to our stable, high level rope access. We have IRATA trained staff to complement our Installation team on smoke ventilation systems. Our customers are delighted we are expanding our services to this cost effective area. Our qualified engineers are supported by AIRATA trained supervisor to ensure all safety aspects are covered during the high level rope access operations. We can inspect existing smoke ventilation shafts for leaks which degrade the efficiency of the smoke control system. We can also overcome mechanical access problems where a building has been completed but additional smoke control safety works are required. 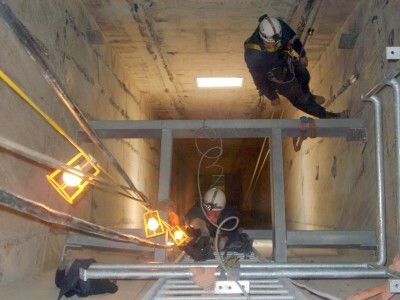 The idea of our additional high level rope access service came from our customers who are increasing requested to carry out high level work by rope access. Less down time for our customers. Our efficient high level rope access team can move around complex structures or restricted access places by means of rope very easily.